This is the first non-IH related post on Bob’s Bad Binder. Basically this article was on another site, and all automotive items will be moved here. These will probably be rare. My everyday driver is a 1965 Buick LeSabre with a 300 V8. This is a great engine – I can get over 20 mpg on the highway. One of the modifications I made was to replace the point type distributor with a GM HEI out of a later model Buick 350 V8. The distributor fits correctly, but did require some slight modifications (grinding) to the intake manifold. The power, performance and starting after this modification has been tremendous. I would suggest puting an HEI in any vintage GM product if there is a direct replacement. I’m not sure where to find casting numbers, haven’t had a need to mess with that for a while. A 64-65 Buick had a 300, a 401 or a 425 for V8 options. If your car hasn’t been modified, it should be one of these, and it should be pretty easy to tell a 300 from a 401. The 340 wasn’t available until 66. Bore and stroke on a 300 is 3.75 x 3.40. The great thing about an HEI distributor is the 350 Buick version fits a 300 and a 340 without a problem. They all take the same distributor. I think I had to take a grinder to the intake just to get maximum rotation, but the modification was minimal. I hope this helps. If you have any further questions please feel free to ask. Oddly enough, I have two of these cars and the Buick 300 V8 was the first engine I ever rebuilt, so I do know a bit about them. I’ll take some pictures of the engine compartment so we can compare and post them. If you want to send me some pics of your ride, I’d love to see them. Anyone know the recommended gap for points and plugs on the 1972 350? Going to switch to electronic when the parts get here from stateside, but till then…. 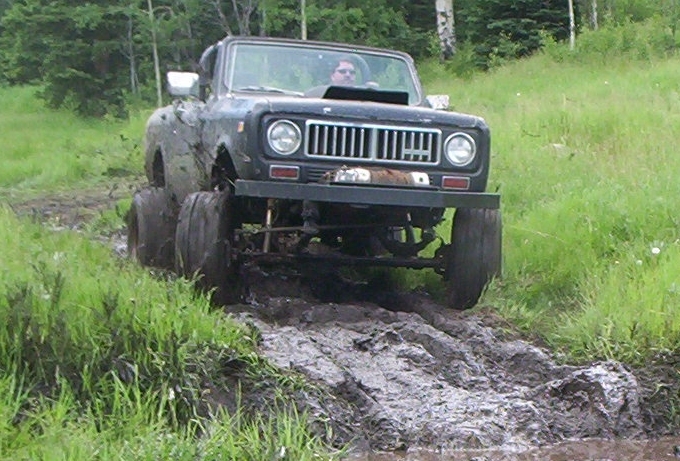 I need a hei distributor to fit a 1974 ih scout with a 345 v 8. Jack: That’s a tricky request. The problem is, even if you have an HEI modified to fit the engine, the cap won’t clear the water neck on a 345. There are vendors that make an HEI for the 345, but you have to do major modifications to the waterneck and I’ve read about people having difficulting getting them to work. Your best bet is to use a later GM EFI distributor. You can have the distributor modified to use the IHC bottom end and the GM pickup and cap. Once you get this completed you can use an MSD box to control the timing. My Dad had this done on his, I’ll get the details and post an article on it. i have a 67 lesabre with the 340-4. it has the high preformance option. what year buick do i need to convert it to hei? I believe any year Buick V8 that had an HEI should work. HEIs became standard in 75. The only thing to be careful of is be sure it is a Buick engine. Many late 70s/early 80s Buicks had Chevy V8s rather than Buick engines.